The Christmas Holiday Food Drive will kick off on November 29, 2017 with the arrival of the CP Holiday Train at the Midhurst Station on Anne St North arriving at 12:00 noon. For many this is a busy cheerful time with family and friends. Unfortunately this is not the case for everyone, if you have experienced job loss, a breakdown in health, a family crisis or some other life crisis, this time of year is not always cheerful. The Food Bank wants to help these families and individuals and work towards “A Community Where No One is Hungry”. Our Christmas Holiday Food Drive goal for this year is to raise 180,000 pounds of food; this will replenish our shelves and take us well into the 2018 year. 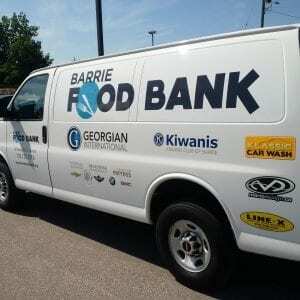 Usage of the Barrie Food Bank continues to be consistent, distributing approximately 75,000 pounds of food each month. In December we expect to see close to 2800 people, nearly 600 households that will come through their doors in need of food. The most needed items at the food bank include: powdered milk, peanut butter, canned stew, canned luncheon meats, juices, rice, baby food and formula, canned tuna, mayonnaise, canned vegetables, soups, can pasta, macaroni, school snacks, sugar, flour, pancake mix, condiments such as ketchup and mustard and personal hygiene products like soap, shampoo, toothpaste and feminine products.